Makgeolli is a traditional Korean rice wine that was traditionally home brewed. The complex and robust flavors of this drink pairs wonderfully with all Korean foods but most wonderfully with flavorful foods like Kimchi and Korean BBQs. Makgeolli (막걸리) or Makkolli is a traditional Korean alcoholic beverage brewed from rice and a fermentation starter called nuruk 누룩. It is traditionally a ‘fast’ or ’emergency brew’ which can be ready in 7-10 days and is made in a single step fermentation (Danyangju 단양주). Traditionally this rice wine was brewed in each home and served as everyday drink as well as for special occasions like weddings. What does Makgeolli taste like? 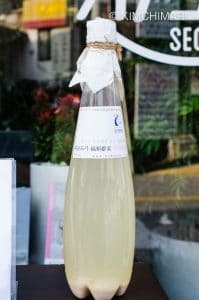 This Korean rice wine is a milky and often fizzy drink having a complex flavor profile that also has sweet, sour, with even a little bit of bitter tastes. It can also have a fruity, dusty, floral aroma with a bit of chalky texture. It is a great filling drink that tastes great on its own but even better with Korean food. This is the oldest alcoholic drink in Korean cuisine that dates back to Goryeo (고려) Dynasty (918-1320) and some say there are traces of this wine even back to the Three Kingdoms era (57 BC to 668 AD). Makgeolli is a brewed rice wine, traditionally made of just 3 ingredients: rice, water and nuruk. Nuruk is a unique fermentation starter that contains yeast and bacteria that break down the rice to produce alcohol – making this rice wine an alcoholic drink. Makgeolli was considered a “farmer’s wine (Nongju 농주)” because of the high nutritional content and carbonation, it was a great refreshing energy drink for farmers. When I was a child, I distinctly remember seeing farmers and construction workers drinking this white colored drink in a shallow bowl (사발) every afternoon during their break. When I saw that scene, as a kid, I thought that they were all maybe alcoholics??!! But I realize today this was more than a simple alcoholic drink for them, it was part of daily life for these hard working Koreans. Makgeolli helped the workers regain their energy with its nutrition and health benefits to continue for another few hours before their hard day was over. 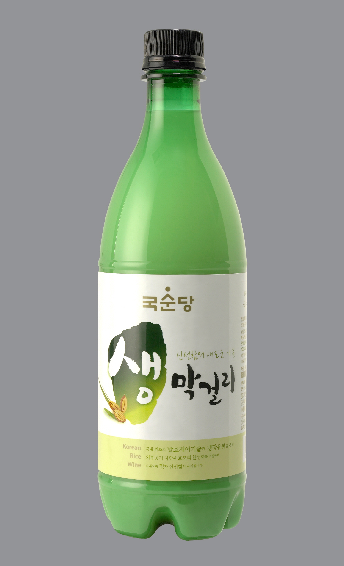 Commercially sold makgeolli usually contains between 6 – 9% alcohol content. Traditional brews start with 12-18% alcohol content but in recent years, companies started to dilute the original wine with water to lower the alcohol content down to 6-9% so that they could sell to a wider audience and also make it easier to export. Mixed – you will usually see sediments at the bottom of the bottle. Gently mix by turning bottle upside down and up a few times.If unpasteurized, it may kind of explode. Open and close the cap, repeat to let the gas out a little at a time but not the content. Unmixed – Some prefer to drink the top clear liquid without the rice sediments. Let sediments settle to the bottom and DO NOT mix but just carefully pour the top clearer liquid out. This will also reduce calories of the drink. Shelf Life – pasteurized ones are good for even few months. Unpasteurized, Saeng (Draft) ones are different. Some draft wines are good for 30 days and even up to 60 days. They all need to be refrigerated and even with refrigeration, it will continue to ferment with taste changing over time. Once opened, it is best to consume within couple days. Pair with grilled meats, kimchi, kimchi pancake, bindaetteok and more. The basic makgeolli recipe is quite simple in concept because it just involves steaming rice then mixing the cooked rice, water (usually in 1:1 ratio) and nuruk. You brew for 7-10 days and then filter. And then you either drink it straight or dilute with water 1:1. The exact ratio of the rice, water and nuruk however, can vary from recipe to recipe. I’m currently in the process of experimenting with different recipes to come up with the best one and I’m experiencing that there are details to the technique, not just the recipe that produces different results – even if using the same recipe!! 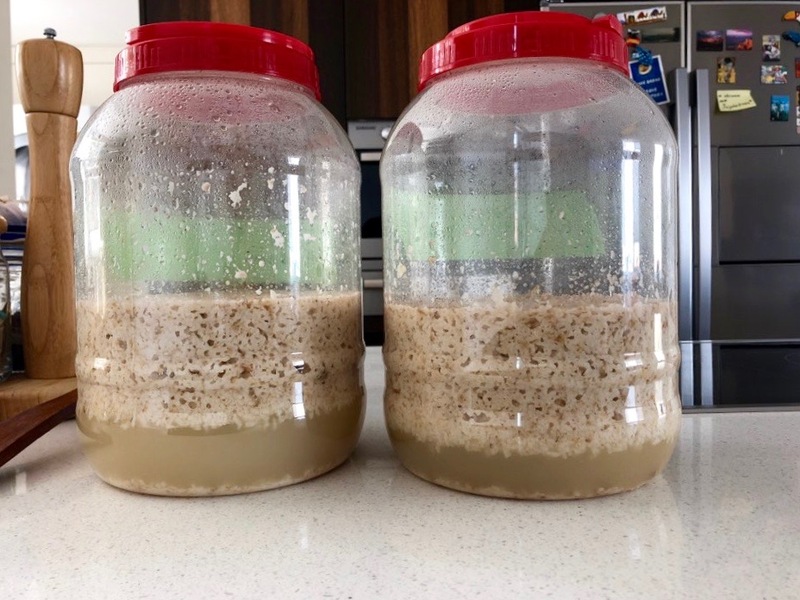 FYI – these are 2 bottles made during a Makgeolli making class at Sool Company in Seoul, using the same recipe but by different people. BTW, if you are interested in makgeolli making and you get to visit Seoul, I highly recommend this class. ** NOTE, the content may be different for exported versions and they may also change with time. Please reconfirm the content before you buy or drink. Above table is roughly ordered in terms of their price (in Korea). The last 3 makgeolli’s are are from craft breweries that claim to use no Aspartame and only good quality ingredients. And their price shows it as they are all about 10 times (yes! 10 times!!) more expensive than the first 6, raning around $1-2 in Korea. The middle 3 range around $2-4. 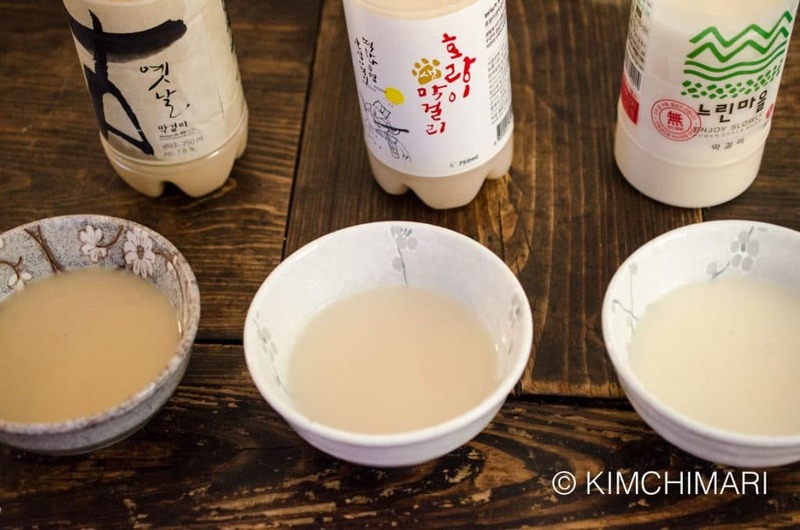 If made the traditional way with no pasteurization, makgeolli has great health benefits. The major benefit is that makgeolli (if not pasteurized) has tens of millions of live cultures in just 1 ml. In addition, it is high in fiber, vitamin B, C and low in cholesterol. However, it is also high in carbohydrates which results in about 54 kcal for 100 ml. The higher calorie content was actually a good thing in the old days when Koreans didn’t have a high calorie diet. Note that the live cultures exist only in Saeng (Draft) Makgeolli 생막걸리 and NOT in any that say Salgyeun Takju 살균탁주. If it doesn’t say it’s Saeng 생, it could well be pasteurized. A very good reason why you want to make your own at home if you cannot get unpasteurized ones. Until recently, almost all bottled makgeolli’s had added sweeteners like Aspartame. Although Aspartame has so far been determined to be safe and has not been shown to have any adverse health effects, many Koreans have started to criticize the use of Aspartame in these drinks. 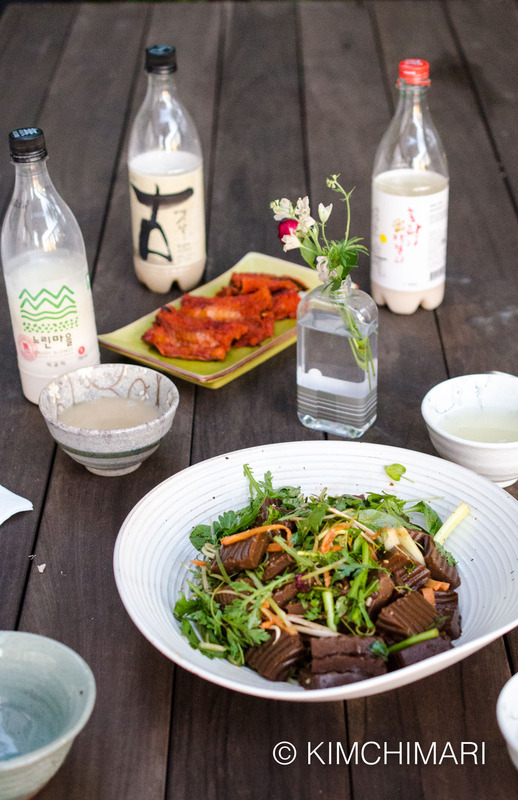 Due to this new trend, there are now many companies and craft breweries in Korea that make makgeolli without Aspartame or other artificial ingredients. In my table below, you will see that there are a few that do not include any artificial or unhealthy sweeteners. And to me, these few are not only better quality but also taste the BEST. These taste profile sources are from a Korean site called http://www.jurojuro.com/ except for Handmade Makgeolli which does not appear in the site since it is quite new and is not sold at stores but only at select Makgeolli bars. So those numbers are based on my recollection of how it tasted. My top 3 would be Go, Handmade and Boksundoga. In terms of taste only, Handmade by Sulawon is by far the most delicious, robust and complex. It tastes truly home made and the ingredients are just simply 3. But it is not cheap. Also is not available widely even in Korea. Boksundoga is quite fabulous in that it tastes like Makgeolli champagne. I LOVE fizzy drinks so this was a very fun drink to have. But I was disappointed to learn that it contained Aspartame and the price is high – in the $10 range. Gooksoondang‘s Go/Yetnal wins the #1 SPOT for both my husband and I, because it is dry and not sweet, has a wonderful fruity but also musty, a little sour with a full body. It’s not very sparkly though..
Well, it was a lot of work but I hope you find this info useful. Please let me know how you like it and share with your friends if you can! Please stay tuned for my upcoming post on how to make makgeolli and my recent trip to Seoul. Hi, thanks for your post. I made some and now I am slightly scared to drink it for fear of getting sick(or poisoned). Is there a way to tell whether it is safe for consumption? That’s a great question. Honestly I don’t have any scientific way for you to tell whether it’s safe to drink or not. But what I can tell you is that I have rarely of people getting sick from it. You can try drinking just a sip and see how it tastes. Remember homemade Makgeoli will have stronger alcohol, less sweet and little more sour. But should still taste pleasant. It will turn more sour as time goes and then it really won’t be good to drink. Leave it longer and it can become vinegar later. Love to hear how it was!! Thank you for asking. Hi. This was a good article. Could you add a section on the basic recipe. You say you are playing with the amounts of ingredients but a little list would help. Thanks! Hi Justin, thank you so much for asking! I’m sorry, I was working on it and then it became summer and it was hard to get good results. I’ve been meaning to try it again this winter so I hope to have it finalized soon! Please check back, or even better, follow my blog if you are not already. Cheers! That’s a great post and a great list. My personal all-time favourite is Neurinmaeul’s “Summer” makgeolli. If you like dry makgeolli I also highly recommend 해창 Haechang makgeolli. My favourite flavoured makgeolli is 사곡 알밤막걸리 Sagok chestnut makgeolli, super thick and rich in flavour. Thank you very much for such great suggestions! I will definitely try the makgeollis you are recommending. I always wondered about the chestnut one but good to know. Glad you found my post and list helpful. Thank you JinJoo for taking the time to research for us about makgeolli, it is so informative. I will have to go look for the Gooksoondang Saeng Draft Makgeolli to try soon. I love drinking makgeolli but just don’t know which one is the good one to pick. Thank you Vicki for appreciating my effort! This makes me very happy. 😍 Yes, I will be posting my makgeolli recipe (after much research and experiments) soon so I hope you will follow my blog! Geonbae! Cheers!! It will be THE GUIDE to Makgeolli when I next visit Korea. Keep well and keep writing!! Aw.. thank you Debbie!! I love Makgeolli too!! Please let me know if you have any more questions or feedback. 감사합니다!